Norway's policies and attitudes about immigration are increasingly complex. There is a deep, dark bias against certain immigrants--mostly Eastern European, Middle Eastern, and North African--and this is one of several reasons that a more conservative political party came to power during the last election. They are expected to crack down on immigration "abuse". But this same political party has also called for another kind of immigration reform , one which would encourage the immigration of skilled workers. This led an engineer named Julien Bourrelle to put together a short, illustrated Guide til Nordmenn . He wanted to increase the awareness of the Norwegian government and empoyers when it comes to the needs of these foreign workers. Having been one himself (a Canadian in Norway), Bourrelle knows that socialization in Norway is complicated, not least because the emotions of the Nordmenn can't be taken at face value. 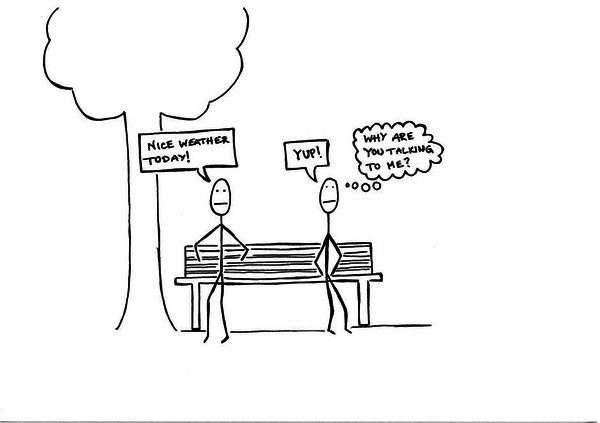 As you can tell from Bourrelle's drawing, it is rare in Norway for strangers to address one another without some pressing cause. For Americans, especially, this is a tough norm to adjust to. Take me, for example. I like to smile at strangers. I like reach out and assist people who are lost or struggling to get their baby's pram up the steps into the trikk. If a girl in front of me on the street has forgotten to remove the tags from her new clothes, I tap her on the shoulder and tell her. If something funny happens while I'm waiting in line at the post office, I like to share the moment with the people around me by cracking a joke. Yeah, when I do these things here, I usually get one response: crickets. And it's rubbing off on me! A few days ago, I was at the grocery store, checking out. A woman bagging groceries next to me reached out and turned my box of kattsand (kitty litter) to read the label, then (gasp!) asked me a question about it. I had to physically shake my head before answering. So rare is this occasion. I suspect that Norwegians are probably more proactively friendly with one another, and we can't discount the power of the language barrier. These generous, intelligent people speak fluent English, but it's still not their first language. Conveying emotion can be difficult, even impossible, when you're not communicating in your mother tongue. The best way to get to know people when you move to a new country is to respect what they hold dear. You don't need to change yourself, at least not entirely. But meet the Norwegians on their own terms, and you'll be find them hospitable enough. It's easy. Eat brown cheese on your waffles. Gå på tur . Laugh at the antics of Ylvis and learn the lyrics to What Does the Fox Say? . Dress up a little for Syttende Mai . Be curious about their history. Don't complain about the 25% Value Added Tax (unless you also have complaints about the benefits that come with it... free education, free medical care, and the like). Norwegians aren't that simple. Life in Norway isn't that simple. But getting along, making friends, is. If you're willing to put yourself out there. Hollywood's Golden Age: Who's still with us?